← Is 40% of telecoms value about turf not technology? Notice that although the businesses that emerged were often vertically integrated (operating across the FASP4 model), the asset that was really generating the value was often the ‘place’. Indeed, the ‘space’ layer (network) in the backbone often became a very difficult business: the economics of fibre meant that oversupply rapidly became an issue in the backbone. This led to massive consolidation and survival only for the leanest and largest players. But that’s another story. The point is that being the first to lay fibre in any area was the fundamental source of value, rather than lighting up that fibre and operating the network. Now, exclusivity in the last mile has been preserved for longer. As a result, around two-thirds of the end-to-end value of a link has traditionally been in the last mile. But now we see multiple parallel paths being established even there. Here’s a parable to explain what’s been going on. Imagine an isolated house owned by some wealthy homeowners in the overgrown jungle of ‘non connectivity’. The only route to this house was a tiny overgrown path that looped from the nearest settlement, TeleTown, and back. You could barely squeeze along it. But that small path was enough for TeleTown, whose residents made a fine business from the little house. A trader from the town brought boxes of provisions to the house each day, and was paid handsomely by the isolated homeowners. The trader in turn paid a whole load of his townsfolk to maintain the ‘loop’ (as the path was known) and keep it usable. Many years later, there was a great commotion in the jungle as a rival trader from a new settlement, CableCity, hacked a new, wider path to the same house using the new Highway Forest Cut (HFC) technique. This allowed regular deliveries by bicycle of a bundle of fresh entertainment (a large package of newspapers!). Never had so much timely produce from civilisation landed on the doormat of the homeowners, and again they rewarded the delivery man well. The whole CableCity economy boomed as content was sourced, packaged and delivered, and the cycle path was continuously maintained. Over the years, the trader and the bicycle delivery man eyed each other enviously. The trader from TeleTown realised that cutting a wider Dark-Jungle Supply Line (DSL) would allow him to get a small cart to the house, allowing him to deliver all sorts of produces and goods, and even the same newspapers as the bicycle man. 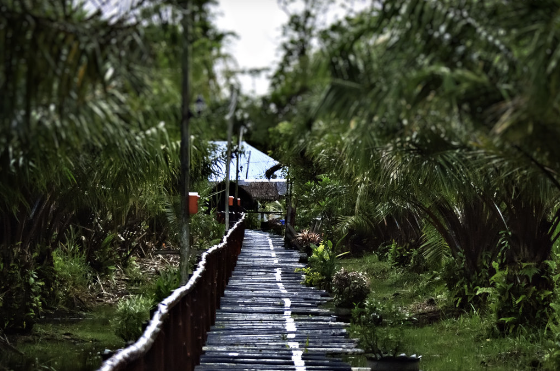 The CableCity residents realised that they could make their path wider and wider too, with their Deep Overgrowth Cutting Special Iron Saw (DOCSIS). This allowed them as well to use a cart to carry both an extensive array of provisions and even more entertainment to the house. Soon there were two massive highways to the little house. The jungle had been thoroughly beaten back. Traders from both towns regularly came with truckloads of produce, far more than the little home could consume. Buying from both was pointless, as each carried the same array of goods, and each was offering significant discounts for one-stop shopping. But each trader had mortgaged their home to build the highway to the little house, and couldn’t afford to walk away with nothing. So the traders stood at the front door, offering lower and lower prices to the bemused homeowner in the middle. Suddenly, both traders looked up in the sky… and saw provisions falling into the front garden on small parachutes. Three helicopters from different Cellular City States were also making deliveries – from the air! Place businesses require heavy investment because they tend to be about digging holes and negotiating with landowners. But the logic of these investments crumble away when exclusivity is gone. That is why we are seeing tower companies set up to sell to multiple MNOs, why mobile players are sharing sites, why ISPs are agreeing infrastructure sharing deals to deal with the costs of FTTH rollout. In my view, this all points to one conclusion. 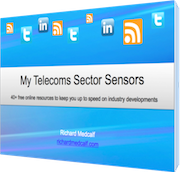 Telcos should increasingly get out of the ‘place’ game – and sell/leaseback the telecoms infrastructure passive assets whilst there is still some exclusivity left in them! They don’t even need to sell them to one player, since scale is a not a big factor in the ‘place’ market. Why not let each local authority manage their own ducts and tower sites? Or every resident fund their own physical duct/fibre connection? This would be a major overhaul for the industry, but would result in a much-needed mind shift. The massive investments and long payback horizons can be passed to entities better able to manage that kind of business. Value is no longer in being the first to lay down the physical asset… so the game can be played elsewhere. Do you agree that the time has come to move away from ‘place exclusivity’ (passive telecoms infrastructure) as the battleground for telecoms? What caveats or nuances would you add? Fully agree with you. Working at the broadband coordination of Lower Austria (public unit) and this approach is one of the pillars of our new broadband strategy. Passive infrastructure (ducts, cables, cabinets, antenna masts, etc.) will be handled in the same way as roads, sewage, water pipes and other public utility (build and owned by public sector, ROI>25 years). The active network will be run by a neutral network operator in an wholesale only mode (ROI=7 years, without subsidy) and thereby open at transparent and fair conditions for all existing and new service providers. In this way the passive fiber infrastructure can be build to almost every building over the next 10-15 years and the competition is maximized (=fair prices, very good service and maximized innovation). The public sector is not “going into the telecom business” but is taking care of what they are doing the last 100 years – taking care about infrastructure – and the primary benefit for the public sector are the spill-over effects in economy, transportation, education, health sector, social life etc. Igor – thank you for your comment and insight from Austria. Really appreciated. I must say that I am unsure of the merits of having only one network operator running active assets on the passive infrastructure however. The reason for this is that such a player will have little incentive to innovate, invest in new technologies, lower its delivery cost or improve quality, etc.. I know such an approach has been used in some places – such as Amsterdam – but I think competition in the active networking layer is a good thing and should lead to innovation and lower prices. Why create a monopoly in that layer? The active operator has a contract for 7 years. This is the usual technology life cycle and if the operator is not upgrading after 7 years, he can be exchanged by a new operator with state of art active equipment. I would also strongly differentiate between cities as urban areas and rural areas that we have to cover. In rural areas the amount of potential customers is very low. There is no place for two or more active operators to make there ROI, especially not if they are obliged to be neutral (wholesale services only, no retail!). If we would be open on the physical layer (as Stokab in Stockholm) the rent would be attractive only for traditional vertically integrated operators resulting in low competition and very limited innovation. On the other hand we want to have more than one neutral active operator in Lower Austria, but not in the same geographic area. At the moment we have two under contract – OpenNet GmbH and Optisis GmbH. If there is only one operator (as in Amsterdam) its an PPP project with a different constellation and other pros and cons compared to a lease model we are running right now. In Stokholm there are many different active operators using the same Stokab passive infrastructure and they can also provide retail services. Now there are more than 100 active operators, some of them neutral (wholesale only) and some of them traditional vertically integrated, but this can happen only in urban areas, not rural as I explained before. I’d offer quite the opposite is true Richard. Place is the primary comparative advantage of all three towns. Particular services like Voice, Video, Information, Shopping, etc.. are not unique to a town, rather they are readily interchanged by Mr & Mrs homeowner and tots. They really, really like that stuff being cycled, carted and airdropped in, always ordering more. Problem is that our traders get seduced into becoming manufactures of content and forget that at its core, each trader is an enabler linking the homeowner to content and services. Place is a battle to be the First-est with the Most-est. Someday, one of those traders shall stumble out of the jungle upon DataLogisticsMetroplex and learn the secrets of the Forest Topography Transformation Hauler (FTTH) from whence exclusivity of Place is reborn. Robert, thanks for your comment. I agree with most if not all of what you say, though I’m not sure that means that “quite the opposite” is true! Perhaps my title “the race for place… is over” is a bit premature… but the point is that convergence is resulting in redundant parallel infrastructures being built. Both TeleTown and CableCity will aspire to the Forest Topography Transformation Hauler (FTTH) status. Either both will deploy, and then engage in a price war to sell services on the asset they just built (since the consumer will probably just buy services from one infrastructure), or one will deploy FTTH and the other will drop prices to try to get the most out of their sunk investment and be able to compete with the superior FTTH infrastructure (worsening the business case of FTTH). Either way, we are moving (have moved) from a world where different telecom infrastructures do different things to one where they do pretty much the same things (especially for the needs of the majority of the market). At that point, does it make sense for each trader to focus on maintaining their own unique pathway (parallel passive assets), or should they focus on doing the enabling (active assets)? I am arguing for the latter. Solid reply Richard, and yes we’re in sync. Had a long winded reply lost; Karmatic wit. Bottom line, Internet Access has evolved into a strong enough product by itself to enable the FTTH or FTTN provider to retain a retail relationship with the homeowner while employing an open access business model in lieu of needing to be the triple play. This turns the worm of Place back in favor of eyeballs over content boding more network investment.